Unlike some rich bloggers like Mr Miyagi who can buy $10 "Not So Big" prawn noodles, our breakfast fare at River South prawn mee was a more modest $3.50 a bowl. 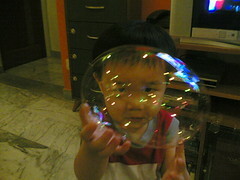 As usual, we took Isaac along to keep him from disrupting his 姐姐's ABA lesson at home. I insisted on ordering a separate bowl of kuay teow soup for Isaac so that Grandma could have a bowl of dry beehoon mee with chilli for a change. We gave him some handmade fish cake (each sold seperately) with his kuay teow (no prawns for him) and he tucked in with his spoon and hands. 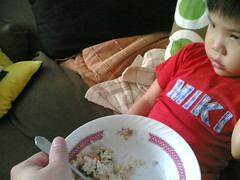 Mommy spent a big part of the breakfast trying to stop him from using his hand to pick up his food, in vain. The chwee kuay (steamed rice cake topped with chopped preserved radish) at this Tai Thong Crescent coffee shop was excellent too. The wife liked the crunchy Chai Poh (chopped preserved radish). Even my mom said it was good, which is rare Chwee Kuay praise from her, because my brothers and I grew up living one floor above a very good Chwee Kuay hawker, Auntie Ah Wah, who sold the stuff at a Joo Seng Road coffee shop donkey years ago. Being able to buy her excellent Chwee Kuay directly from her flat kind of spoiled us, so my family are somewhat Chwee Kuay snobs now. Latest TODAY column: I want to be an Adventurer too. I am convinced that Singapore is the land of dreams. I plan to apply to the Northeast CDC Dare to Dream Fund for $150,000 so that I can play my online game World of Warcraft for 220 hours, without bathing, using deodorant and doing any work. 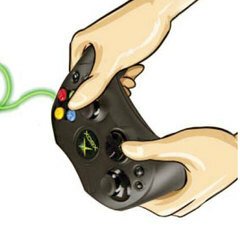 I believe this will be a whole new Guinness World Record for the longest stretch of online gaming. My new title will be mr brown: Online Adventurer. 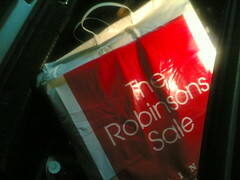 What is probably the only reason to enter ERP-laden Orchard Road: The Robinson's Sale. Especially if your mom has the credit card that gives an additional 5% rebate. But the ratio of grownups to one Isaac must be at least 3:1. It took Mom, the wife and me taking turns to watch him this morning so that we could get our shopping done. Decent bargains aside, what made the trip so enjoyable was the excellent customer service shown by the staff there, both young and old. From the Braun Buffel salesgirl to the young salesman at the John Harold business pants racks and another guy at Erstklassic Erstklassig (the German shoe brand we love but don't know how to pronounce) and Ecco men's shoes department, all of them displayed product knowledge, cheerful patience and earnest service. The shoe guy even gave Isaac a sweet, and did not blink or frown when Isaac grabbed some cans of liquid shoe polish and mixed up the colour-coded caps. "Don't worry, I'll sort it out," he said with a smile. Mom had to take Isaac out of the store so that we could shop in peace. But when they were at the corridor looking at the cheerful festive decorations, he proudly showed her a wallet in his tiny hand. Her first thought was, oh no, whose wallet is that?! Then she realised it was a new one, and rushed back into the store to return Isaac's "loot". 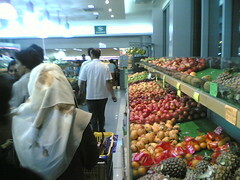 We entered Orchard at 10.30am to avoid the ERP charges. By the time we left, it was 1pm and we had to pay toll charges to leave Orchard Road. But despite this ERP unpleasantness, the good experience at Robinson's more than made up for it and we happily lugged home our shopping bags of stuff, and a very tired little boy. You can find more funny classifieds here. So who was the Rocket freaking Scientist who decided that the top floor of the Bishan HDB multistorey carpark linked to the forever-jammed Bishan 8 shopping mall did not need lighting turned on at night? Bad enough it was night and dark. It was also raining, killing visibility further. There was also construction going on on that floor, and many many cars parking, dropping passengers off, trying not to crash into humans and other cars. It was a surreal sight, all these cars depending on their headlights and the nearby Circle Line construction lights to navigate the Mordor carpark of the Dark Lord Moron. The renovated Mustafa's is a kickass shopping centre, man. It is open 24 hours, has a huge supermarket (but no rice milk I was desperately looking for for my Faith), has a bookstore, electronics and hardware departments, and is new and swanky. At least the new 2nd to 4th floors were. I ended up buying the rest of my groceries there, like diapers (XL, L and Newborn! ), wet wipes, and baby bottom cream. Small point on merchandising and product placement... don't make me go to the 3rd floor for the diapers and wipes, then B1 for the baby bottles and the 1st floor pharmacy for the Balmex nappy rash lotion. Oh, and they use this technology not seen in many supermarkets these days. It's called a price tag. Imagine that, real human readable numbers on every price tag. Love it. I commented to the cashier on the busy night despite the next day being a working day, and she said with late shift wry humour, "Every night busy. Singaporeans don't sleep." "idoh-wan idoh-wan," Faith said, turning her head from my spoonful of rice. We all heard it, Celia, Mommy and me. A rare moment of speech from Faith. We all tried to look casual about it, but our faces had the "Did you hear that?!!!" look. Isaac also supplied his own surprise. I found out from the smell after he got onto my lap as I sat at the computer. "Isaac, did you poo?" I said without breathing in. "Papa! Poo! Poo!" he declared happily. "Mmm! Mmm!" he added for emphasis. I look forward to the day he tells us before the fact. Sigh. Christmas Day went by quietly. We learned to cope without Ah Gu, our trusty confinement maid who just left. Joy woke up just once last night, but she took a while to go to sleep. We suspect she was missing Ah Gu already. Knowing we needed to get a little relief in the morning from dealing with baby Joy, my mom swooped in to whisk my two older ones to have breakfast with Meng my younger brother and his two little girls. The missus and I joined them at Sunshine Plaza after the missus took a long-awaited shower. It was supposed to be dimsum at Victor's Kitchen, but Meng got it wrong and forgot they close on Monday. But they had a hearty meal at Parklane Wanton Mee anyway. When the wife and I arrived, Isaac was already halfway through a bowl of kuay teow soup, and Faith was enjoying pieces of Char Siew. 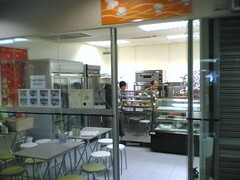 After noodles, we walked over the new Delicious Muffins bakery at #01-05 to buy some curry puffs and chicken pies for tea. The lady before us bought 15 of the $1.50 puffs, so they must be good. Meng said they are famous for their muffins (but they were not ready when we dropped in, sigh). "You must buy the muffins and eat them on the spot," he said, "cos that's when they are piping hot and good." While the missus was in there buying the pies, the lady boss called us in to try some of her shop's famous Chocolate Royal cake. Chef Johnny Ngiam won an award for this cake, and they sell an 18cm 900g one for around $34. It was delicious, and Faith and her cousin ate most of it. 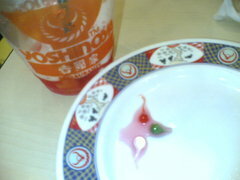 We spent a little time at Takashimaya after that, because Meng wanted to exchange a T-shirt he bought. Faith was a little overwhelmed by the mall (she usually is, by malls), crying loudly and insisting on being carried. Her autistic senses receive too much info in confined busy places like this. And Isaac kept crawling under the door into the changing room I was in, while I was trying on a polo tee. So we decided to do the shopping another day, throwing a longing look at Kinokuniya bookstore as the whole gang of 4 kids, 2 grandparents, and 3 parents trooped back to our two cars. "Next time we need to shop, maybe we leave the kids behind," said the wife. Even dedicated Mommies need their personal mall time. We have (a bigger by one) family, good friends, two chocolate cakes, one chiffon cake, beer and wine, and food 煮炒 from the coffee shop downstairs. The kind of cozy Singapore Christmas Eve we like. We were supposed to eat in the living room but the kids took over, so the adults took refuge in the kitchen. We wish you all a blessed Christmas, and may peace and love shine upon you and your loved ones. 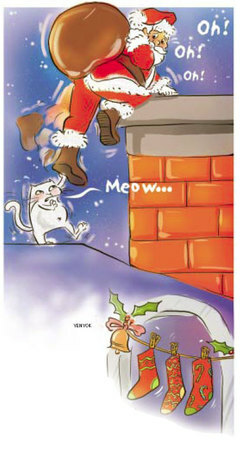 How have you been, Santa? I hope you are well. You really should look into losing some weight (preferably without using harmful drugs). Even I started exercising this year, after more than 10 years of getting pudgy. You don't want to keel over and die at the wheel while careening across the skies in your sled, do you? I have been a very good boy this year. I made a baby, my third, thereby helping the country increase its population by just a little. I also continued donating to the National Kidney Foundation, even though the NKF, sorry, the Old NKF, was so messed up. I only hope that more than 30 cents of my monthly Giro payment of $3 to the New NKF will help people in need. Papa wants me to tell you we are very busy here. I just turned one month and everyone had nice cakes and red eggs to eat, except me. I am still drinking Mommy's milk. We are all down with the flu here. 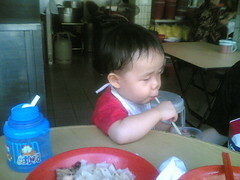 Isaac 哥哥 and Granny 奶奶 got sick first. Then Auntie Celia got it too. 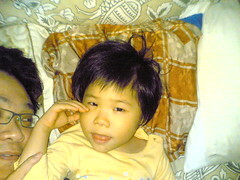 Then Faith 姐姐 got a bit of runny nose. 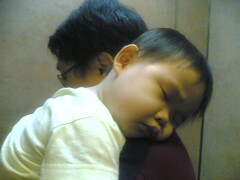 And then Papa got a fever, throat infection and cold. I cried all night last night because my nose was blocked and I didn't know how to breath through my mouth. Ah Gu who has been helping Mommy to look after me all month put Vicks on my chest and back and carried me around to comfort me. I will miss her when she leaves tomorrow. 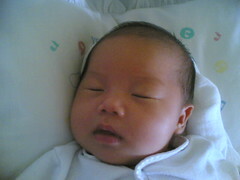 I finally fell asleep in the early morning, when Papa took this photo of me after Ah Gu bent over to listen to my breathing. Then he left for work. You people ah, give you subsidy and you ask me how much the thing cost and say actually is not subsidy. Must I always explain that just because it is a subsidy does not mean I don't make a profit? This is called The Singapore Subsidy. NKF said it saved patients more than $3.5 million by offering them lower drug prices and subsidies. This was not true. It made close to $1 million each year, in 2003 and 2004, in gross profit from the sale of such drugs. The gross profit margin worked out to almost 40 per cent each year. And that was because NKF did not pass on the rebates it got on its bulk purchase of medicine. For example, it said one drug cost $25. It gave patients a $13 discount and charged them $12. But NKF paid only $8.20 for the drug. It pocketed a 46 per cent profit. Instead, Mr Subramaniam, the accountant, said the way the NKF treated the definition of subsidy and the way KPMG did were from"different perspectives". The NKF defined subsidy as the difference between the amount a patient would pay for treatement and drugs elsewhere in Singapore and the amount they paid the NKF. "In my understanding of NKF's view, subsidy must be tested against the market rate and not the net amount incurred." I REFER to the letters, 'What goes into pricing of HDB flats' (ST, July 23) by Mr Hiong Kum Meng and 'Subsidy should be based on flat's building cost' (ST, July 27) by Mr Mohamed Rafiq Hamjah. Mr Hiong concluded that the increase in HDB resale prices has outstripped wage growth, based on a comparison of changes in the Resale Price Index with changes in average nominal wages between 1993 and 2003. We would like to explain that resale flats are transacted in the open market on a willing buyer-willing seller basis. The prices are not set by HDB. Prices can fluctuate, depending on factors such as the economic outlook, employment situation and sentiments in the property market. What is important is that HDB prices its new flats so that the majority of Singaporeans can afford one. From 1993 to 2003, the prices of new four-room flats increased by 2.6 per cent per annum, below the annual increase of 5.3 per cent in average wages cited by Mr Hiong. New-flat prices did not rise as steeply as resale-flat prices, because HDB prices new flats below their equivalent market price, that is, at a subsidy. Mr Mohamed asked why HDB's subsidy for new flats is related to the market price and not the building cost of a flat. Today, first-time HDB flat buyers can buy either resale or new flats. Those who opt to buy resale flats from the open market can take up a housing grant of $30,000 or $40,000, which allows them to enjoy a discount off the market price of the flat. 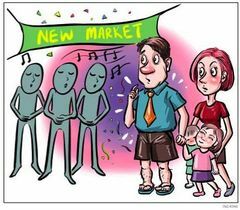 Those who opt to buy new flats from HDB also enjoy a discount off the equivalent market price of the flat. The difference between what the buyer pays HDB for his flat and what it is actually worth in the market is a direct and real subsidy provided by HDB to the buyer. Like the housing grant for resale flats, the provision of such a market-related subsidy in the case of new flats has enabled HDB to keep its flats affordable for the majority of Singaporeans. Johnny does a Zhng My Car Charity Show and risks life and limb to zhng the car of his lady guest, Celeste. Call 1-900-ZHNG and donate now! Our callers operators are standing by! The weekend was a blur of random kid moments. Joy is almost a month old, and we will soon be losing the help of the confinement maid. I introduced Joy to the Papa March for Pacification of Crying Infants™ where Papa carries said crying baby and marches around the house while singing the tune used by SAF marching bands, used with much success on his two other children. Discussions have begun with Joy's Grandma on the arrangements in the coming weeks, now that we are short one pair of hands. Isaac showed us he can count from 1 to 10, with a small problem with the number 7, which we have to admit, is somewhat hard to pronounce. He also impressed his Papa (who does not see him as often as his Grandparents or his on-maternity-leave Mother) with his ability to sing his ABC song. He also showed his Papa how many pictures he can identify from his favourite books, his love for reading helped by Grandma and Mommy. His speech is coming a little late, despite being 25 months old now, because he does not have the benefit of an older sibling who can talk, but nobody is too fussed by the delay. Isaac also knows how to pronounce every one of The Wiggles' names — Murray, Jeff, Anthony and Greg. He makes his Mommy count to three, and say "Wake up Jeff!" so that he can pretend to be the always-asleep Jeff and wake up running around. 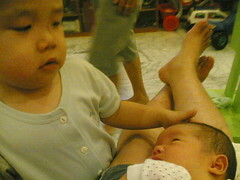 Isaac also learned to kiss his little sister, Joy, goodnight, and give her "sayang" pat on the head, without poking her in the eye or using too much force. A very important life skill. He had a touch of running nose, which made him cranky for most of Sunday. Grandma had the same thing, but no one knows who gave it to whom. Isaac's big sister, Faith, took three hours on Saturday to go to sleep, and kept her parents up on Friday night till almost 1am. Way past her bedtime. Good thing Papa knows how to surf the web, read email and IM with his mobile phone, in the dark, or he would be bored to tears. On Sunday, the two older children were kept at Grandma's by Papa, to keep them out of Mommy's hair, who is beginning to go stir-crazy staying home all day being Joy's milk factory. And the wife ate the most expensive laksa with "hum" (cockles) for breakfast on Sunday. $3 for the bowl, $62 for the late night clinic visit for food poisoning. It was very painful for Mommy's tummy and Papa's wallet. Oh, as part of our exciting film-festivalesque weekend, we rented some DVDs and we watched Hitch by Will Smith on Saturday (quite enjoyed it), and some bloody local film-festival-award-winning short film called A Wicked Tale, which had Little Red Riding Hood in it (er, the DVD cover art was very nice). I don't want to know what my jelly drink is made of. In case you were wondering why my blog was displaying an entry from 9th December since yesterday afternoon, it is because Typepad, the hosted blogging service I am using for mrbrown.com, had a major outage due to a "catastrophic failure" that crippled its storage system. It lasted for more than 12 hours and they just got it back up at 3pm PST (about 7am Singapore time). The outdated version you saw was a backup of my blog they used, which was a few days old, with commenting turned off, while their support staff worked to bring the service back up. My pages are up to date again after republishing (I found out I had thousands of pages on my site), but some of the photos may be missing. These will return as the Typepad folks restore our photos from their backups. Sorry for any inconvenience caused and thanks to the friends who called to tell me, "Eh! Your blog kena hacked ah? How come become backdated one?" I felt so helpless because I could not blog about exciting stuff like, you can now get Gmail on your mobile phone. Slashdot has a piece on how the explosive growth of the blogosphere is straining infrastructure to its limits. More news on this from Forbes and The Register. 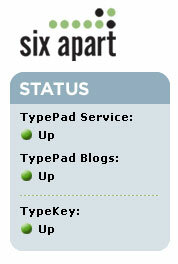 The outage also made "Typepad" the number one search term on Technorati. This Rebel Attack Cruiser from Star Wars Episode III is on auction at eBay, all 8 feet of super-detailed LEGO goodness. So far the bid is USD16,000. I have small children in my home who will reduce this Cruiser into tiny bits faster than a superlaser beam from the Death Star, and my flat is too small, if not I also go and bid. Really. 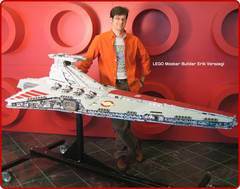 "Own a one-of-a-kind 8-foot LEGO Rebel Attack Cruiser™ model designed by LEGO Master Builder Erik Varszegi..."
100% of the proceeds from this auction will go to Habitat for Humanity International's Hurricane Relief Efforts. Latest TODAY column: Enjoy the moment before the next upgrading comes. 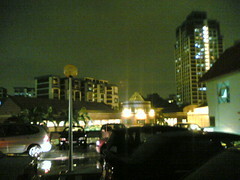 The wet market near my home was recently upgraded, after about 18 months of construction. I know this sounds odd, but every time I hear something in Singapore is going to be upgraded, I get worried. 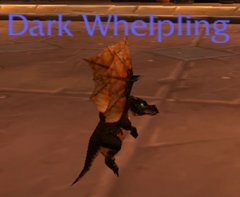 I was in the Badlands killing whelps to get the Black Drake's heart for my quest when, after about about half an hour of killing them, this Dark Whelpling pet dropped. A druid player who was farming these things near me told me, after saving me from a big nasty elite Dragonkin I was stupid enough to try to whack myself (I was told the dragonkins had the Black Drake's heart too), that he had been killing whelps here for the last four days, trying to get any Whelpling as a pet for a Christmas present. The Dark Whelplings have a 1 in 1200 chance of dropping from a killed whelp. My beginner's luck, I guess. Good, I need the gold anyway, tempting as it is to keep it as my own pet. Oh, and hello to the two readers at Pantheon Guild who dropped by my Warcraft post about my little boy Isaac. Wah lau, this Weblog Awards thing is one tough fight, man! One Xiaxue I can deal with, but she went to clone herself! Liddat how to win her? Even my good friend Friskodude says I "never had a chance". Well, two can play that game. Here, the best kept secret of Bloggers.sg! TWO mr browns. Meet B1 and B2. Yes, now you know how I found the energy to be part of that Blogger Conference. There were actually two of us. B1 moderated the Community panel, and B2 covered the Technology Panel. Later B1 went home to be with the wife and kids, and B2 stayed back at DXO to party. Now gentle reader, go forth and multiply my votes.